I have to admit when Kwame opened the question and answer session by saying “Let’s get it on!”, I expected a Q & A of epic proportions. 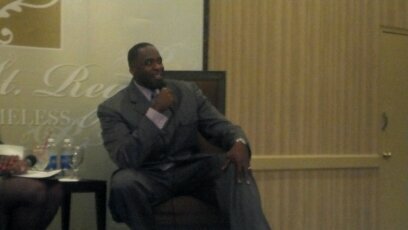 Kwame was offering himself for every journalist in the room to feast on. I could see the look in the eyes of my fellow journalists. They were hungry and their pens were at the ready. What did we get? Slim pickings. Kwame did not waver. He answered each question comfortably and completely. His answers did not bear anymore information that wasn’t already known. The only time he seemed slightly rattled is when he was asked questions concerning his mom, former State Representative Carolyn Cheeks-Kilpatrick. This was understandable. He explained it to all in the room. ” The two worst days of my life.” as the former mayor recalls, “The first was explaining the affair to my kids and the second was laying in a prison cell knowing that my mom lost the election because of me”. The remorse on his face was apparent. He said it was at that point when he realized what his actions cost the city. His mother had done so much for the city of Detroit and now that champion for the city is out of office. He said at that time, “I cried like a baby”. It finally got to him. The disappointment the citizens of Detroit felt in his actions, he now felt in himself. It was that moment that opened his eyes. He began to realize what he had and how much damage his decisions had done. Kwame spends his time speaking around the country. Even speaking at T.D. Jake’s “ManPower” conference. Kwame maintain that he wants to help young men avoid the path he took. He feels that he didn’t deal with his inner demons before he got into office and they got the better of him. Kwame maintains that this cost him more than anything, Not youth or inexperience. To this day, Kwame maintains that he cannot be forgiven here in Detroit. It doesn’t matter how much he claims that he has changed. Kwame said “I don’t believe I can get a fair trial here in Detroit.” when asked about his up coming Federal trial . “I would be better off if they hung me from the giant fist downtown” Kwame jokes. I think he might be right in a way, This was made evident but the number of journalist that turned out. People still place the blame at his feet. As leader of this city, he failed. In the court of Public Opinion, he has been found guilty. His word is no longer above reproach and his name vilified in Detroit history, That’s where we should leave him. If there was one thing that I can take from him, that would be that we have to let him go mentally as a city. Kwame was absolutely right about that, Until we do that, we will never move forward and identify the real problems of our city, Holla if you hear me! Posted on August 25, 2012 by KELLY GREENE	• This entry was posted in People, Politics and tagged city of detroit, Kwame Kilpatrick. Bookmark the permalink.